came up blowing from any direction except north-west. The R23 to Volksrust is undulating and since Volksrust is the same altitude as Germiston, one should be able to free-wheel for half of the 230km. We kept pedalling, though, and kept up a good rhythm in spite of the wind. Just outside Greylingstad we made the first of our many refreshment stops where Gail and Noelene fed us with all sorts of delicious eats. This became a most welcome feature of the tour keeping us going all along the long road to ‘Maritzburg. The traffic on the R23 was fairly heavy as far as Standerton but most of the truck drivers were quite considerate of the cyclists, with the exception of one crazy trucker who virtually forced Gails’ support car off the road. We carried on through the dry Highveld landscape where the road was in fairly good condition until some 20km before Volksrust where there were road works with ‘stop and go’s’. Some of them were to our advantage as they didn’t stop cyclists and we could sometimes use the new sections not yet open to vehicles. Just before Volksrust, though, we were forced to use the untarred detour sections and had a couple of punctures as a result. It took the slow group some 11 hours to reach Volksrust. The fast group wouldn’t reveal how long it took them, but I suspect they were not much more than an hour ahead of us. Stuckys Guesthouse proved to be the nicest of our overnight stops with very friendly management. Braaimeesters Riaan en André het daar vir ons lekker vleis gebraai. Friday morning dawned overcast and cold with drizzle starting as we set off and we all donned rain-gear, but the rain held off and the jackets were soon discarded. Now on the N11, the road was much better as we climbed up to the highest point of our trip at almost 1700m before plunging down Laing’s Nek past Mount Majuba and beautiful scenery to cross the Buffalo River at 1530m. Gerald told us that it would be every man for himself down the pass and the race snakes could go as fast as they liked – we would regroup afterwards. With a tailwind at last, we made good time along past the battlefields of the 1880’s, skirting Newcastle and Chelmsford Dam. There was another steep climb ahead over the Biggarsberg and then down into Ladysmith. The climbing didn’t stop here, though, as Mountain View Guest House is up on Wagon Hill. The slow group took about 6.5 hours to do the 160km – a much easier ride than the first day. Saturday proved to be a very hot Natal day as we headed off towards ‘Maritzburg. After a fairly easy section throughColenso we dropped down into Estcourt which lies in a basin at some 1200m. After crossing the Bushmans River the R103 immediately starts climbing. Here we encountered some cattle in the road looking quite bewildered and Simon proved to have cowboy skills herding the poor beasts off the road to safety. The dreaded Warthog’s Hill (officially Griffin’s Hill) now loomed ahead in the distance. One climbs for some 17 km to the summit nearly as high as Germiston at 1590m with the road getting steeper and steeper with a maximum gradient of 1 in 8. I tried and failed to catch Des up here and he said afterwards, “I wasn’t going to let an old toppie beat me.” There was a welcome rest stop at the top before dropping down into the rather sad looking town of Mooiriver. Along the Midlands Meander the tired legs started to complain and the going was hot and tough. possible to cycle all the way to Durban, after all. After passing Howick we learned that the fast group had got to ‘Maritzburg to find that we were not booked in at Ilawu B&B but another place in the middle of town by the same name. Quite confusing. 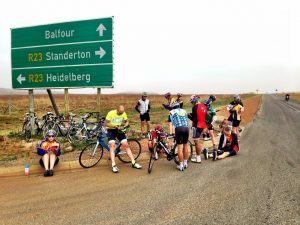 We took old Howick Road (where the tandems had to be loaded into Don’s van as their brakes wouldn’t be able to cope with the steep downhill) down into ‘Maritzburg. At the bottom the guys were pouring water on their rims to cool them down. Germiston Wheelers team all looked very smart as we set out in our new club colours. Everyone seemed to have a good race in spite of tired legs with a good number breaking three hours. As an ex Comrades runner I enjoyed cruising along the route where I’d trudged for many years, coming to the conclusion that the wheel was a good invention!